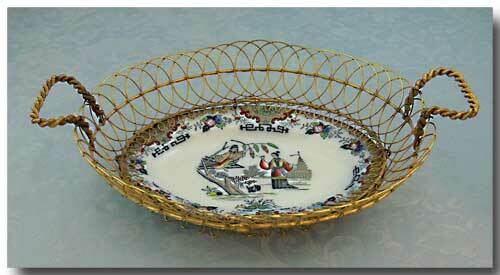 A GILT WIREWORK BASKET SURROUNDS AN OVAL CERAMIC PLATE WITH AN ORIENTAL THEME IN HAND-PAINTED COLOURS TITLED “TIMOR”. 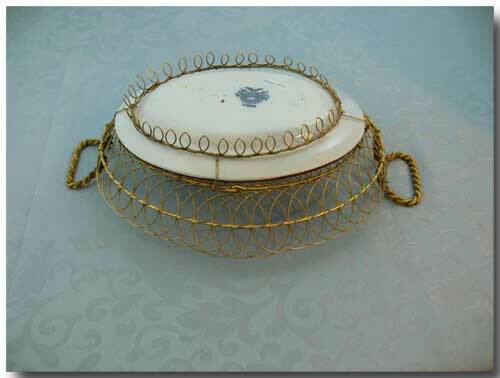 THE BASE OF THE BASKET CONSISTS OF CIRCULAR LOOPS WHICH ACT AS FEET. 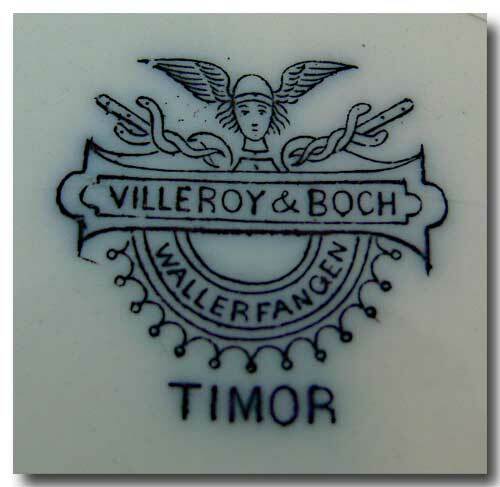 THE PLATE IS SIGNED: “VILLEROY & BOCH/WALLERFANGEN/TIMOR” AND HAS AN IMPRESSED “10” ON THE UNDERSIDE. CONDITION EXCELLENT. VILLEROY & BOCH, STEINGUTFABRIK, WALLERFANGEN COMMENCED OPERATIONS IN 1790 AND CLOSED FOLLOWING THE RECESSION IN 1931. THE MARK ON THIS PLATE WAS USED FROM 1874 TO 1909. 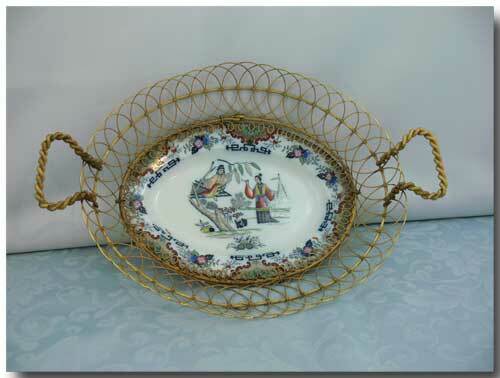 PLATE 8 1/4" w. X 6" D.
BASKET 11 3/4" W. HANDLE TO HANDLE) BY 8 1/2" D.